This article is about the airline of India. For the bridge connecting an air terminal to a jetliner, see jetway. For the routes through the sky flown by jetliners, see airway (aviation). Not to be confused with Jat Airways, Jetstar Airways, Jetstar Asia Airways, or JetBlue Airways. Jet Airways is an Indian international airline based in Mumbai, which has currently temporarily suspended all flight operations as of mid-April 2019. In October 2017, it was the second-largest airline in India after IndiGo with a 17.8% passenger market share. It operated flights to 52 destinations from its main hub at Chhatrapati Shivaji International Airport, Mumbai, and secondary hubs at Indira Gandhi International Airport, New Delhi and Kempegowda International Airport, Bengaluru. Incorporated in April 1992 as a limited liability company, the airline began operations as an air taxi operator in 1993. It began full-fledged operations in 1995 with international flights added in 2004. The airline went public in 2005 and in 2007, it acquired Air Sahara. It became the largest carrier by passenger market share in the country by 2010, a position it held until 2012. Since February 2019, the airline had been facing a financial crisis and on 25 March 2019, the airline's founder and only chairman, Naresh Goyal, resigned due to the airline's situation. The airline was forced to cease international flights on 12 April 2019 as they had an operational fleet of less than five, the Indian requirement. On 17 April 2019, Jet Airways suspended all flight operations, due to lenders rejecting a Rs 400 crore emergency funding. Jet Airways was incorporated as a limited liability company on 1 April 1992, with capital investment obtained from Tail Winds, a company registered in Isle of Man by Naresh Goyal and his children; Nivaan Goyal and Namrata Goyal. It started operations as an air taxi operator on 5 May 1993, operating flight 9W321 from Bombay to Ahmedabad. In its first financial year, Jet airways served 12 destinations in India and carried 663,000 passengers and had a 6.6% market share. The airline had a fleet of four Boeing 737-300 aircraft leased from Ansett Worldwide, making it the first operator of the type in the country. By the next year, it was India's second largest private airline, having carried 1.7 million passengers in 1994. The fleet grew to seven aircraft, including three Boeing 737-400 aircraft leased from Malaysian Airlines. On 12 May 1994, all of Jet Airways' shares were transferred to Tailwinds International, whose equity capital was held by Naresh Goyal (60%), Gulf Air (20%) and Kuwait Airways (20%). The airline was granted a scheduled airline status on 14 January 1995. It entered into a marketing agreement with KLM the same year. In 1996, the airline placed a $375 million order for four 737-400 and six 737-800 aircraft from Boeing, which were delivered between 1997 and 2000. Jet Airways was the first airline in Southeast Asia to order the 737-800. In the financial year 1996-97, the airline carried 2.4 million passengers and had a marketshare of 20 percent, second highest after state-owned Indian Airlines. By this time, the airline had a fleet of twelve Boeing 737 aircraft, operating 83 daily flights to 23 domestic destinations. In 1997, the Cabinet Committee On Foreign Investment (CCFI) of the Government of India announced that foreign airlines would no longer be permitted to take an equity stake in joint ventures with Indian aviation companies, reversing the Government's earlier policy which had allowed carriers such as Gulf Air, Kuwait Airways and Lufthansa to hold a maximum 40% equity stake in their joint ventures with Indian partners. In October 1997, as per this directive, Naresh Goyal took back control of Trade Winds from its foreign investors. At the Paris Air Show in June 1999, Jet Airways announced an order worth approximately $550 million for ten Boeing 737-800 aircraft. The airline purchased its first Boeing 737-400 simulator from CAE Inc. in 2001. By April 2001, the airline fleet had grown to 30 aircraft and was operating over 195 flights daily to 37 destinations within India. Jet Airways suffered losses for the first time since its establishment in financial year 2001-2002 as demand fell and costs increased. Jet Airways was announced as launch customer for the Embraer 175 at the Farnborough air show in 2002, with an order for 10 aircraft and 10 options worth $520 million. But the deal was postponed due the airline's financial difficulties and eventually fell through. In 2003, the Indian government decided to allow private carriers to operate international services to countries in south Asia, such as Bangladesh, Nepal and Sri Lanka. and Jet began preparations to launch international services. The airline launched its first international flight in March 2004 from Chennai to Colombo. Jet Airways was listed on the Bombay Stock Exchange and became public company on 28 December 2004. After the Government lifted the foreign ownership limits on Indian airlines to 49% from the previous 40%, the airline moved to raise funds via an IPO. The company's IPO in February 2005, which offered 20% of the airline's stock, saw strong interest from investors leading to oversubscription in retail, non-institutional and institutional tranches and raised Rs 18.9 billion, instantly making Naresh Goyal a paper billionaire. Towards the end of 2004, the government had announced that privately owned scheduled carriers meeting certain criteria could operate to all countries apart from those in the Middle East. Then in January 2005, the Ministry of Civil Aviation granted rights to Jet Airways to operate services to London Heathrow. The airline started its first international, long-haul flight to London in May 2005 with two-class Airbus A340-300s sub-leased from South African Airways. In January 2006, Jet Airways announced its intention to acquire Air Sahara for US$500 million in an all-cash deal; however, the deal fell through in June 2006. On 12 April 2007, the deal was back on track with Jet Airways agreeing to pay ₹14.5 billion (US$200 million). On 16 April 2007, Air Sahara was renamed as JetLite and was marketed between a low-cost carrier and a full service airline. JetLite became a wholly owned subsidiary of Jet Airways. In August 2008, Jet Airways announced its plans to integrate JetLite into Jet Airways. In October 2008, Jet Airways laid off 1,900 of its employees, who were later re-instated due to intervention from the Ministry of Civil Aviation. In October 2008, Jet Airways entered into an alliance with rival Kingfisher Airlines for code-sharing on domestic and international flights, collaboration on frequent-flyer program and sharing crew and ground handling equipment. On 8 May 2009, Jet Airways launched another low-cost brand, Jet Konnect. It operated a fleet of Boeing 737 Next Generation and ATR 72 aircraft and operated on profitable short-haul routes with higher passenger load factors. In the third quarter of 2010, Jet Airways became the largest airline in India with a passenger market share of 22.6%. In July 2012, the airline officially sought government approval to join Star Alliance. Jet Airways is not a member of Star Alliance as of 2017. In June 2011, it became the first domestic airline in India to ban meat products and liquids in check-in baggage. Jet Airways merged the JetLite brand into Jet Konnect on 25 March 2012 and started offering business-class seats after the demise of Kingfisher Airlines. In 2013, Etihad Airways planned to buy a stake in the airline following the government's announcement in September 2012 that foreign airlines could take a stake of up to 49% in Indian carriers. On 24 April 2013, Jet announced that it was ready to sell a 24% stake in the airline to Etihad for US$379 million. The deal, which was expected to be signed in January 2013, was postponed and was completed on 12 November 2013. Naresh Goyal retained 51% ownership of the stock. In 2013, the airline lowered prices and entered into a fare war with low-cost carriers IndiGo and SpiceJet due to falling passenger demand. In February 2013, the airline's market value dropped by ₹4.84 billion (US$67 million) due to falling share prices. Jet Airways made profits in the third quarter of the financial year 2013–14, after posting losses over the previous year. Jet Airways announced on 11 August 2014 that it would phase out Jet Konnect by the end of the year as part of plans to re-position itself as a uniform full-service operator. On 1 December 2014, Jet Konnect was fully merged with Jet Airways, making it the third full-service airline in India besides Air India and Vistara. In December 2015, Jet Airways announced the closure of its scissor hub at Brussels Airport by March 2016 and the opening of new hub at Amsterdam Schiphol Airport effective 27 March 2016. As of February 2016, it is the second-largest airline in India after IndiGo, with a 21.2% passenger-market share. As of November 2018, Jet Airways has been reported to have a negative financial outlook due to increasing losses. Therefore, cost-cutting measures as well as talks with potential investors or buyers have commenced. In March 2019 it was reported that nearly a fourth of Jet Airways' aircraft were grounded due to unpaid lease rates. The lenders' consortium is expected to invoke their entire 51% stake in the airline to clear their dues. The other equity partner, Etihad, planned to decide to either rescue or sever ties with Jet Airways during its board meeting slated on 31 March. On 25 March 2019, Mr Naresh Goyal and his wife Anitha Goyal stepped down from the Board of Directors. During subsequent talks, SBI-led domestic lenders agreed to provide an additional emergency funding of Rs 1500 crore to Jet. This amount was further curtailed to Rs 200 crore as SBI awaited an RBI update on the same. The amount has been allocated only to facilitate payments to suppliers of Jet in the interim, as the bidding process is initiated. On 5 April, Indian Oil Corporation stopped supplying fuel to the airline, citing non-payment of dues as the emergency funds have still not been credited. The employees of Jet have also indicated their intent to stop work if their dues for past three months are not paid. Meanwhile, lessors are preparing to repossess the airline's Boeing 777 long-haul fleet over unpaid leasing rates. On 10 April, an aircraft was seized at Amsterdam Airport by a European cargo-services provider over non-payment of dues. On 12 April 2019, Jet Airways announced the suspension of all eastern-India-bound and all international flights due to a lack of available aircraft. As of 13 April 2019, the airline is operating less than ten planes, down from 123 in December 2018. As of 17 April 2019, Jet Airways has suspended all flight operations, due to lenders rejecting Rs 400 crore of emergency funding. On 18 April 2019, Jet Airways' last flight flew from Amritsar to Mumbai and its membership in the International Air Transport Association (IATA) was suspended. The airline's head office is located at Siroya Center in Andheri, Mumbai. The head office was previously located at S. M. Center, a rented six-storey building in Andheri and was moved following criticism regarding the working conditions. It was navy blue with light grey and chrome yellow. The top and bottom of the aircraft were painted in light grey with the flying sun logo in the navy blue background. In 2007, a new livery was created by Landor Associates which added yellow and gold ribbons; the design retained the dark blue and gold-accented colour scheme along with the airline's "flying sun" logo. A new yellow uniform was simultaneously introduced, created by Italian designer Roberto Capucci. Jet Airways introduced its new identity in conjunction with a global brand re-launch which included new aircraft and seating. Jet Airways was expected to begin service to Newark via Brussels in June 2005. In March 2005, the airline submitted an application to the United States Department of Transportation; however, the application was opposed by Nancy Heckerman, CEO of a US registered company Jet Airways Inc., based in Bethesda, Maryland, alleging trademark infringement and connections to terrorist outfit Al Qaeda. Jet Airways rebuffed the claims, which was tossed out as a frivolous lawsuit. Asmin Tariq, a contractor working for the airline as a security agent at Heathrow airport was implicated in the foiled terror plot on 10 August 2006 to blow up several transatlantic airliners belonging to three different US airlines. Subsequently, the Governments of UK and Singapore inquired security-related information from the Ministry of External Affairs on Jet Airways; clearance was further delayed to fly to the US. The US State Department gave the go-ahead for the airline to fly to the US on 15 November 2006. In August 2014, two pilots of Jet Airways were suspended after a plane carrying 280 passengers dropped 5,000 feet (1,500 m) mid-air en route from Mumbai to Brussels. On 2 December 2016, Jet Airways flight 9W7083 from Bhopal to Mumbai was held up by a large group of passengers headed for a wedding in Mumbai. There were allegations from other passengers that the wedding party was politically connected and attempted to coerce the cabin crew to disembark passengers, so that additional members of their party could be accommodated. The airline claimed it was a technical glitch in their booking system which led to overbooking. In 2016, the airline was implicated in the Gupta family controversy in South Africa when it was alleged by former African National Congress MP Vytjie Mentor that members of the business family had offered her the position of Minister of Public Enterprises, on behalf of President Jacob Zuma, if she agreed to arrange for South African Airways to drop their India route so that Jet Airways could acquire it instead. On 12 December 2001, an internal memo from the Indian intelligence agencies RAW and IB to the Indian home ministry stated that they had evidence that Jet Airways had intermittent contact with Dawood Ibrahim, Chota Shakeel and other gangs of the Indian underworld, related to financial transactions. This information was leaked to the media and parliament proceedings were stalled. Subsequently, in 2016, reports surfaced that the initial investment for Jet Airways itself had come through shell companies from the Isle of Man, and was heavily funded by the Indian underworld. This was documented in detail in the book A feast of vultures. As per its website, Jet Airways serves 57 destinations including 37 domestic and 20 international destinations in 15 countries across Asia, Europe, North America and Middle East. The airline has its primary hub at Mumbai and secondary bases at Delhi and Bangalore. In March 2004, the airline introduced its first international destination, Colombo, with flights connecting to Chennai. London was the airline's first long-haul destination and was launched in 2005. Since 2007, Jet Airways has had a scissors hub at Brussels Airport for onward transatlantic connections to North America, which was replaced by Amsterdam Schiphol Airport from 27 March 2016. In 2008, the airline was forced to discontinue international routes because these attracted losses due to global economic downturn; it terminated services to San Francisco and Shanghai. The airline planned to restore the Mumbai–Shanghai route by the end of 2011 but never did so. In 2012, the airline withdrew flights to New York and closed the Delhi–Milan route in 2013. On 1 March 2016, the airline announced the integration of domestic and international operations in Mumbai airport and moved its entire operations to the newly constructed Terminal 2. In 2018, Jet airways announced a new destination, Manchester in UK. It will start operations to Manchester from its hub, Mumbai from November. It would be the first airline to connect Manchester with India. 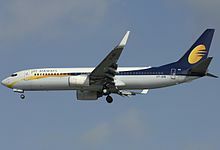 Jet Airways placed its first order for four Boeing 737-400 and 30 Boeing 737-800 aircraft on 11 December 1996; and the first aircraft was delivered on 12 November 1997. It placed its second order for six Boeing 737-700 and two Boeing 737-900 aircraft on 14 June 1999 with deliveries starting in May 2001. On 5 January 2012, it inducted five ATR 72-600 series aircraft to operate on domestic regional routes. Long-haul routes are served using its fleet of Airbus A330-200, Airbus A330-300 and Boeing 777-300ER aircraft. The airline placed an order for 10 Boeing 777-300ER aircraft on 29 September 2005 which were delivered in 2007. Jet Airways ordered 10 Boeing 787 Dreamliner aircraft on 29 December 2006 to operate on long-haul routes. It placed a further order for 75 Boeing 737 MAX aircraft on 23 April 2013 as part of modernisation of its fleet of 737s. In April 2018 and July 2018 the airline entered an agreement to acquire an additional 75 Boeing 737 MAX aircraft each, taking its order tally to 225 Boeing 737 MAX jets. Jet Airways had three classes of service: First, Première (Business) and Economy. First class was available only in Boeing 777-300ER aircraft. The first class offered private suites; it featured seats convertible to a fully flat bed, personal LCD TVs and in-seat power supply. Première class was available on long-haul international flights operated by Airbus A330-200 and Boeing 777-300ER aircraft featured recliner seats, fully flat beds with personal LCD TVs and in-seat power. Première class in domestic flights offered recliner seats with larger leg room in 2-2 configuration. Economy class on long-haul aircraft had a 32 inches (810 mm) seat pitch with a footrest and the cabin was configured in 2-4-2 on the Airbus A330-200 and 3-4-3 on the Boeing 777-300ER. Economy seats on the Airbus A330 and Boeing 777 had a personal 10.6 inches (270 mm) touchscreen LCD TV. Domestic flights operated by Boeing 737 aircraft had Première and Economy classes and the ATR 72 aircraft had an all-economy class configuration. Economy class on Boeing 737 had a 30 inches (760 mm) seat pitch with personal LCD behind each seat. Meals are not served in economy class on domestic routes. In February 2016, Jet Airways announced the introduction of an in-flight entertainment service for streaming of entertainment content directly to Wi-Fi enabled personal devices of the passengers. JetPrivilege is the airline's Frequent-flyer program. 1 July 2007: Jet Airways Flight 3307, an ATR 72-212A (registered VT-JCE), flying on the Bhopal-Indore route was involved in an accident caused by bad weather. There were no fatalities amongst the 45 passengers and four crew but the aircraft was damaged beyond repair and written off. 27 December 2016: A Jet Airways Boeing 737-800, registration VT-JBG performing flight 9W-2374 from Goa to Mumbai (India) with 154 passengers and 7 crew, backtracked runway 26, lined up runway 26 and was accelerating the engines for takeoff when the aircraft continued to turn right, the crew rejected takeoff, the aircraft went off the right runway edge almost perpendicular, went over soft ground and across a road and came to a stop with the nose gear collapsed and both engines making ground contact. The aircraft was evacuated, 16 occupants received minor injuries as result of the evacuation. 19 September 2018: Flight 697 going from Mumbai to Jaipur with 166 passengers and five crew members returned to Mumbai after some passengers complained of ear pain and nose bleeding due to a loss in cabin pressure. Medical help was given to 30 passengers. ^ a b "Jet Airways". ch-aviation. Archived from the original on 5 August 2017. Retrieved 2 August 2017. ^ "JO 7340.2G Contractions" (PDF). Federal Aviation Administration. 2 August 2017. p. 3-1-17. Archived (PDF) from the original on 11 June 2017. Retrieved 2 August 2017. ^ "Jet Airways shut down temporarily for want of funds". ^ "Hunt for Jet Airways' buyer takes SBI, Naresh Goyal to TPG Capital and Delta Air Lines". ^ "'It's not the end of journey', Naresh Goyal tells staff after Jet Airways exit". ^ "Airline Membership". IATA. Archived from the original on 11 July 2015. Retrieved 12 June 2011. ^ a b c d e Company history, Jet airways. The Economic Times (Report). Archived from the original on 3 January 2016. Retrieved 25 March 2016. ^ "Vinay Dube joins Jet Airways as CEO". The Economic Times. 10 August 2017. Archived from the original on 12 August 2017. Retrieved 12 August 2017. ^ a b "Audited Financial Year Results for the Financial Year ended 31st March 2018" (PDF). JetAirways. Retrieved 10 May 2018. ^ Jet Airways Annual Report 2017 (PDF) (Report). Jet Airways. Archived from the original (PDF) on 22 December 2017. Retrieved 19 December 2017. ^ a b "Traffic Report 2017". Directorate General of Civil Aviation. ^ a b Chowdhury, Anirban (17 April 2019). "Jet Airways to suspend all operations from tonight". The Economic Times. Retrieved 17 April 2019. ^ Sinha, Aditya (30 September 2016). "Book review: A Feast Of Vultures: A sobering read that has a sledgehammer effect on one's political optimism". Live Mint. Retrieved 26 October 2018. ^ "Jet Airways: 25 years of Indian hospitality in the air". Condé Nast Traveler. 5 May 2018. Retrieved 16 February 2019. ^ "Jet Power". FlightGlobal. 7 March 2000. Retrieved 16 February 2019. ^ "Gulf Air/Kuwait takes Tailwinds stake". FlightGlobal. 6 October 1993. Retrieved 16 February 2019. ^ "Jet Airways claims 737-300 first". FlightGlobal. 26 May 1993. Retrieved 16 February 2019. ^ "June marks another milestone in the Boeing-India romance". The Hindu Business Line. 26 June 2018. Retrieved 16 February 2019. ^ a b c "KLM signs up India ally". FlightGlobal. 21 September 1994. Retrieved 16 February 2019. ^ "India raises status of air taxi operators". FlightGlobal. 21 September 1994. Retrieved 16 February 2019. ^ "Jet Airways begins 737 fleet expansion". FlightGlobal. 19 November 1997. Retrieved 16 February 2019. ^ "New 737 launch stresses technology and low cost". FlightGlobal. 18 December 1996. Retrieved 16 February 2019. ^ a b "Jet Airways Chooses Boeing Next-Generation 737-800s". Boeing Press release. 14 June 1999. Retrieved 16 February 2019. ^ "India's Jet Challenger". FlightGlobal. 18 June 1997. Retrieved 16 February 2019. ^ "Mystery in the East". FlightGlobal. 26 February 1997. Retrieved 16 February 2019. ^ "Jet Airways investors take first step towards share sale". FlightGlobal. 18 June 1997. Retrieved 16 February 2019. ^ "Census:civil simuators". FlightGlobal. 2 April 2002. Retrieved 17 February 2019. ^ "World airline directory - Jet Airways". FlightGlobal. 27 March 2001. Retrieved 17 February 2019. ^ "Indian Promise". FlightGlobal. 1 May 2003. Retrieved 17 February 2019. ^ "Embraer 175 Nets Large Order From Jet Airways Of India". Aviation Week Network. 24 July 2002. Retrieved 17 February 2019. ^ "BA/Qantas move on purchase". FlightGlobal. 30 July 2002. Retrieved 17 February 2019. ^ "Jet Airways restarts Embraer talks". FlightGlobal. 30 July 2004. Retrieved 17 February 2019. ^ "India keeps investment ban". FlightGlobal. 1 December 2004. Retrieved 17 February 2019. ^ "India opens door to private carriers". FlightGlobal. 1 May 2004. Retrieved 17 February 2019. ^ a b "Jet Airways completes 20 years of operations on Sunday". India Today. 6 May 2013. Archived from the original on 8 April 2016. Retrieved 25 March 2016. ^ "Jet Airways seeks cash via IPO". FlightGlobal. 1 January 2005. Retrieved 17 February 2019. ^ "Jet Airways IPO priced at Rs 1100 per share". Business Standard. 8 February 2005. Retrieved 17 February 2019. ^ "Investors pile into Indian carriers". FlightGlobal. 1 April 2005. Retrieved 17 February 2019. ^ a b "Indian carriers gain UK access". FlightGlobal. 1 March 2005. Retrieved 17 February 2019. ^ "Jet starts new global push". FlightGlobal. 1 July 2005. Retrieved 17 February 2019. ^ "Jet adds to Airbus widebody fleet". FlightGlobal. 17 May 2005. Retrieved 17 February 2019. ^ Sahgal, Priya; Saran, Rohit (10 July 2006). "Why it crashed". India Today. Archived from the original on 8 April 2016. Retrieved 25 March 2016. ^ "Jet finally buys Air Sahara for Rs 1,450 crore". Rediff.com. 12 April 2007. Archived from the original on 29 May 2016. Retrieved 25 March 2016. ^ a b "Jet Airways launches low-cost service". CNN-IBN. 7 May 2009. Archived from the original on 17 October 2012. Retrieved 7 October 2012. ^ "Jet renames Air Sahara 'Jetlite'". Rediff.com. 16 April 2007. Archived from the original on 3 March 2016. Retrieved 25 March 2016. ^ Roy, Mithun (25 August 2008). "JetLite may merge with Jet Airways this year". The Economic Times. Archived from the original on 10 January 2009. Retrieved 30 August 2010. ^ V, Manju (15 October 2008). "Jet Air lays off 850 flight attendants". The Times of India. Archived from the original on 13 January 2009. Retrieved 30 August 2010. ^ "Praful takes credit for reversal of Jet layoffs". The Economic Times. 17 October 2008. Archived from the original on 11 January 2009. Retrieved 30 August 2010. ^ "Kingfisher, Jet in cost-saving alliance". Rediff.com. 14 October 2008. Archived from the original on 7 October 2016. Retrieved 25 March 2016. ^ "What went wrong with Jet Airways' no-frills brand Konnect". Rediff.com. 21 August 2014. Archived from the original on 5 April 2016. Retrieved 25 March 2016. ^ a b "Jet Airways inducts five ATR 72–600 series aircraft". NDTV. 21 January 2013. Archived from the original on 4 March 2016. Retrieved 25 March 2016. ^ "Jet Airways' low-fare service Konnect takes off today". Business Line. 8 May 2009. Archived from the original on 12 September 2010. Retrieved 25 March 2016. ^ "Lean period air traffic same, domestic traffic up". Rediff.com. 19 October 2010. Archived from the original on 20 October 2010. Retrieved 19 October 2010. ^ Shukla, Tarun (1 August 2012). "Jet Airways seeks government nod to join Star Alliance". Live Mint. Archived from the original on 3 September 2012. ^ "Member airlines". staralliance.com. Archived from the original on 6 June 2017. ^ "Jet Airways bans meat products, fliers upset". Hindustan Times. 29 October 2011. Archived from the original on 1 November 2011. Retrieved 7 October 2012. ^ "Jet airways offers business class seats". The Times of India. 15 October 2012. Archived from the original on 4 November 2012. Retrieved 17 October 2012. ^ "Jet Airways discontinues JetLite, merges with Konnect". The Times of India. 19 March 2012. Archived from the original on 23 April 2016. Retrieved 25 March 2016. ^ "Jet discontinues JetLite, merges with Konnect". The Hindu. 19 March 2012. Archived from the original on 3 March 2018. Retrieved 25 March 2016. ^ "Jet Airways to Sell 24% Equity to Etihad Airways". Outlook. 25 April 2013. Archived from the original on 17 May 2013. Retrieved 29 June 2013. ^ "Etihad's Indian investment". The Economist. 8 January 2013. Archived from the original on 15 January 2013. Retrieved 17 January 2013. ^ "Jet-Etihad deal: Expect announcement by Feb 3". Moneycontrol. 17 January 2013. Archived from the original on 7 January 2016. Retrieved 25 March 2016. ^ "Etihad to finalise deal with Jet Airways on Friday". The Economic Times. 22 January 2013. Retrieved 25 March 2016. ^ "Etihad due diligence on Jet Airways seen by next week". Reuters. 4 February 2013. Archived from the original on 6 February 2013. Retrieved 4 February 2013. ^ "Jet Airways and Etihad Airways strategic alliance". Jet Airways. Archived from the original on 18 March 2016. Retrieved 25 March 2016. ^ a b Shareholding pattern, Q3 2015–16 (PDF) (Report). Jet Airways. Archived (PDF) from the original on 14 April 2016. Retrieved 25 March 2016. ^ "SpiceJet slashes domestic airfare for limited period, other airlines may follow". CNN-IBN. 12 January 2013. Archived from the original on 15 January 2013. Retrieved 19 February 2013. ^ "SpiceJet, IndiGo join Jet Airway's airfare war, offer discounts". The Economic Times. 19 February 2013. Retrieved 19 February 2013. ^ "Jet Airways escalates price war, offers 20 lakh tickets at rock bottom rates". Business Today. 20 February 2013. Archived from the original on 4 June 2013. Retrieved 25 March 2016. ^ "Race on to slash airfares: IndiGo, GoAir follow suit as flyers scramble for discounted Jet tickets". The Economic Times. 20 February 2013. Retrieved 20 February 2013. ^ "Shares of Jet Airways down more than 11% on Etihad deal worries". Hindustan Times. 27 February 2013. Archived from the original on 23 April 2013. Retrieved 25 March 2016. ^ "Jet Airways down over 11%; market valuation drops by Rs 484 crore". The Economic Times. 26 February 2013. Retrieved 27 February 2013. ^ "Jet Airways returns to profit". The Hindu. Chennai, India. 2 February 2013. Archived from the original on 5 February 2013. Retrieved 4 February 2013. ^ Sanjai, P.R. (1 February 2013). "Jet Airways swings to profit ahead of likely Etihad deal". Archived from the original on 6 April 2016. Retrieved 25 March 2016. ^ "India's Jet Airways to phase out LCC Jet Konnect". Ch Aviation. 11 August 2014. Archived from the original on 7 January 2016. Retrieved 25 March 2016. ^ "Jet Airways to launch full services on all-economy subsidiary JetKonnect". The Economic Times. New Delhi. Press Trust of India. 18 September 2014. Retrieved 25 March 2015. ^ "Jet Airways to offer full services on all-economy subsidiary JetKonnect". Live Mint. 18 September 2014. Archived from the original on 29 March 2016. Retrieved 25 March 2016. ^ a b "Jet Airways makes Amsterdam its European gateway". The Hindu. 14 December 2015. Archived from the original on 30 January 2017. Retrieved 4 March 2016. ^ "Jet Airways – Amsterdam Our New European Gateway". Jet Airways. Archived from the original on 10 March 2016. Retrieved 25 March 2016. ^ Rai, Nayantara (25 March 2019). "Naresh Goyal, his wife Anita Goyal to exit Jet Airways today". The Economic Times. Retrieved 25 March 2019. ^ "Etihad to take a final call on Jet Airways on March 31: Report". Moneycontrol. Retrieved 25 March 2019. ^ "Indian Oil Corporation stops fuel supply to Jet Airways - Times of India". The Times of India. Retrieved 5 April 2019. ^ "Jet's life support reduced to Rs 200 crore from Rs 1,500 crore - Times of India". The Times of India. Retrieved 8 April 2019. ^ "Flyers stuck as Jet plane seized in Amsterdam before take-off for Mumbai". The Economic Times. 11 April 2019. Retrieved 11 April 2019. ^ Chowdhury, Anirban (5 April 2019). "Other carriers to fly in to occupy Jet Airways airspace". The Economic Times. Retrieved 5 April 2019. ^ "India's Jet Airways suspends operations". www.flightglobal.com. ^ "Airlines body IATA suspends Jet Airways from clearing house membership". www.theweek.in. ^ "Contact Us, Jet Airways". Jet Airways. Archived from the original on 4 June 2009. Retrieved 19 September 2011. ^ "Registered Office, Jet Airways". Jet Airways. Archived from the original on 4 June 2009. Retrieved 25 March 2016. ^ Meredith, Robyn (20 March 2008). "Beyond Airlines, Beyond India". Forbes. Archived from the original on 2 June 2008. Retrieved 27 February 2010. ^ a b c d "Jet Airways sports new look". Business Standard. April 2007. Archived from the original on 4 August 2009. Retrieved 3 March 2009. ^ "Jet Airways Annual Report 2009-2010" (PDF). JetAirways. Archived (PDF) from the original on 4 March 2016. Retrieved 20 June 2015. ^ "Jet Airways Annual Report 2010-2011" (PDF). JetAirways. Archived (PDF) from the original on 23 October 2016. Retrieved 20 June 2015. ^ "Jet Airways Annual Report 2011-2012" (PDF). JetAirways. Archived (PDF) from the original on 4 March 2016. Retrieved 20 June 2015. ^ "Jet Airways Annual Report 2012-2013" (PDF). JetAirways. Archived (PDF) from the original on 4 March 2016. Retrieved 20 June 2015. ^ "Jet Airways Annual Report 2013-2014" (PDF). JetAirways. Archived (PDF) from the original on 5 April 2015. Retrieved 20 June 2015. ^ "Jet Airways Annual Report 2014-2015" (PDF). JetAirways. Archived (PDF) from the original on 5 September 2015. Retrieved 20 June 2015. ^ "Jet Airways Annual Report 2015-2016" (PDF). JetAirways. Archived (PDF) from the original on 2 February 2017. Retrieved 14 November 2017. ^ "Jet Airways Annual Report 2016-2017" (PDF). JetAirways. Archived (PDF) from the original on 1 December 2017. Retrieved 19 November 2017. ^ "Jet Airways Annual Report 2017-2018" (PDF). JetAirways. Archived (PDF) from the original on 19 January 2019. Retrieved 19 January 2019. ^ "Jet Air to take legal action against US company". Rediff.com. 6 June 2005. Archived from the original on 5 April 2016. Retrieved 25 March 2016. ^ a b "UK seeks information on Jet Airways". The Economic Times. 19 August 2006. Retrieved 25 March 2016. ^ Sharma, Praveen (16 November 2006). "Jet gets green signal for US flight". DNA. Retrieved 25 March 2016. ^ "Jet Airways plane plunges 1500 meters over Turkey". News.com. 15 August 2014. Archived from the original on 16 August 2014. Retrieved 16 August 2014. ^ "Jet airways apologises for flight delay". Sify. 2 December 2016. Archived from the original on 20 December 2016. Retrieved 3 December 2016. ^ "'Zuma said it's OK Ntombazana,' says former ANC MP Vytjie Mentor". Times Live. 18 March 2016. Archived from the original on 20 April 2016. Retrieved 13 April 2016. ^ "Vytjie Mentor: I can prove Zuma was with me in the Gupta house". Rand Daily Mail. 17 March 2016. Archived from the original on 22 April 2016. Retrieved 10 April 2016. ^ "Guptas use Waterkloof airforce base as private landing strip". eNCA. 30 April 2013. Archived from the original on 16 February 2016. Retrieved 9 February 2016. ^ "Jet airways got dubious Dubai funds". Times of India. Retrieved 15 November 2018. ^ "A jet propelled by Don Ibrahim". Outlook India. 16 June 2016. Retrieved 15 November 2018. ^ Joseph, Josy. "A feast of vultures". www.afeastofvultures.com. Official website. Retrieved 15 November 2018. ^ "Jet Airways Network". Jet Airways. Archived from the original on 31 March 2016. Retrieved 25 March 2016. ^ Mazumdar, Sanjay (9 May 2005). "India flies into budget air travel era". BBC News. Archived from the original on 26 March 2016. Retrieved 25 March 2016. ^ "Jet set to cancel Mumbai-Shanghai-San Francisco flight". The Economic Times. 11 October 2008. Retrieved 25 March 2016. ^ Cheng, Wing-Gar; Li, Susan (13 December 2010). "Jet Air Will Resume India-China Service Amid Good Growth". Bloomberg. Archived from the original on 9 December 2014. Retrieved 25 March 2016. ^ "Jet Airways to withdraw JFK flights from September 10". The Times of India. 15 June 2012. Archived from the original on 18 June 2012. Retrieved 7 October 2012. ^ "Jet Airways to stop New Delhi-Milan flights from Feb 1, 2013". Saffron Media. 18 January 2013. Archived from the original on 23 May 2013. Retrieved 25 March 2016. ^ "Jet Airways – Terminal 2". Jet Airways. Archived from the original on 6 March 2016. Retrieved 4 March 2016. ^ "Codeshare Partners". Jet Airways. ^ "Nearly 70 Percent of Jet Airways' Fleet Grounded as Airline Suspends International Operations". airlinegeeks.con. Retrieved 17 April 2019. ^ a b c d "Fleet Information". Jet Airways. Retrieved 5 September 2018. ^ a b c d e f "Customer Orders". Boeing. Retrieved 7 October 2012. ^ "Jet Airways cancels all MAX orders". www.bizjournals.com. Retrieved 17 April 2019. ^ "Jet Airways' fleet to remain unchanged for three years". Live Mint. 14 August 2015. Archived from the original on 23 August 2015. Retrieved 14 August 2015. ^ "Jet Airways to buy 75 Boeing B737MAX planes". Live Mint. 9 November 2015. Archived from the original on 17 March 2016. Retrieved 25 March 2016. ^ Shah, Aditi. "Boeing says India's Jet Airways signs firm order for 75 737 MAX jets". Reuters. Retrieved 4 April 2018. ^ "Jet Airways places additional orders for 737 MAX aircraft". The Economic Times. 17 July 2018. ^ a b "First Class". Jet Airways. Archived from the original on 4 April 2016. Retrieved 25 March 2016. ^ a b c "Premiere Class". Jet Airways. Archived from the original on 5 April 2016. Retrieved 25 March 2016. ^ a b c "Economoy Class". Jet Airways. Archived from the original on 5 April 2016. Retrieved 25 March 2016. ^ "Jet airways to start in flight wireless streaming". Money Control. 1 February 2016. Archived from the original on 3 April 2016. Retrieved 25 March 2016. ^ "Aviation Safety Network Accident Description". Aviation Safety Network. Archived from the original on 14 March 2014. Retrieved 5 September 2013. ^ "Indian flight returns after passengers ill by pressure loss". hurriyetdailynews. Retrieved 20 September 2018.